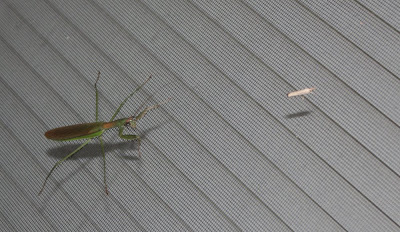 I got home Sunday morning and found a praying mantis on the window screen. The critter wasn’t very large, but I just had to get a picture. I’m sure it appreciated my spoiling its breakfast plans (just look at the way it is looking at me ^_^; ). This entry was posted in Uncategorized on September 22, 2008 by AstroNerdBoy.